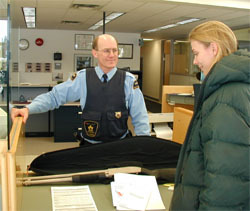 Crossing the border into Canada we had to pass through customs to register our gun. Do you think this is necessary? If not, why? A lot has happened since we left Minnesota last Wednesday. The road to Churchill, Manitoba where we are sitting now, has been quite exciting...Actually, I should probably add here that this statement is pretty incorrect since there are NO roads leading to Churchill!! Think about that. Envision living in a place where with 20-30 Kilometers of road, you can basically drive as far as you can in any direction within the hour. (That's right we are in Canada now, so we have to respect the metric system:). I guess you can say we are beyond the normal terms of civilization. And, we love this place! We have been here a number of times before beginning and ending trips. So, we are returning to familiar faces and good friends. But first we had to get here. We left as planned shortly after we sent the last report. 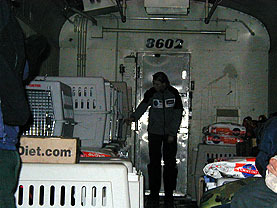 Traveling in the big dog truck were Thomas, Eric the 20 "chosen" Polar Huskies and of course Paul and Mille. 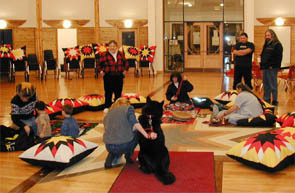 As you might remember we had to get to Winnipeg, Manitoba that night where we were invited to a ceremony for our dogs in the "Circle of Life Thunderbird House" by our friend Tom Campell who is an Ojibwe. All of us two-legged have agreed that this is one of the most powerful experiences we have ever witnessed. Simply breathtaking. Cola thought it was pretty cool too! At first when the drums and the song began we were afraid of how the dogs would react. Big ol' Spank was not to sure to begin with. He definetely looked for the door. Cola on the other hand simply couldn't get close enough! We were very honored to have Don Cardinal, one of the most respected elders conduct the ceremony. 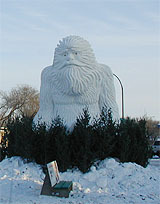 Thursday we spent running the last couple of errands in Winnipeg. 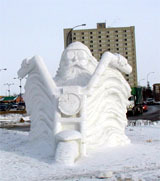 About 750.000 people live in Winnipeg. This week is the voyager week there, so lots of neat stuff was being prepared, amongst other these incredible snow sculptures. This one on the left is Thomas' favorite...(read his bio and you might figure out why). Then the race began. We basically left Winnipeg at the same time as the "Via Rail" train on which we were suppose to get on about 28 hours, and 600 miles later. No problem you might say with a little bit of simple math. Except, nothing is quite that simple when you are driving with 20 Polar Huskies to the end of the road, literally. We have to take the dogs out of their boxes (see last trail report) every 8 hours or so, for at least an hour at a time - so before we are all done, set and ready to go, it easily takes a couple of hours. About 2/3 of the way (after Thompson) the paved road turned into a dirt road. We were lucky though, we had perfect driving weather: sun shinning from a crisp, clear sky. Only one incident. We did have a flat tire on the truck! But considering how heavy we were with equipment and food in the trailer we felt lucky the trailer tires made it through. If you have had a chance to look at all of what is needed to bring on an expedition like this (last weeks Curriculum unit (1)) you know HOW MUCH STUFF we had along. We calculated we needed at least 2 hours to unload it all from the trailer into the train. The train was to leave at midnight. We arrived at the Gillam Train Station at 10:20 and started unloading immediately beginning with the dogs. The trailer almost empty and half the dog crates (for the train) assembled, a very friendly train porter told us that we were in the wrong end of the platform!!!!!!! Aaarhh. A few minutes later the train pulled up. The next 43 minutes and so many seconds were pretty hectic...to say the least. Eric and Thomas sprinted dogs from one end of the platform to the other, Mille was in the box cart loading the dogs into their boxes, while helping push the couple of thousand pounds Paul loaded into the box cart around to make it all fit. It was WILD. But we got it all onboard and the train took off. 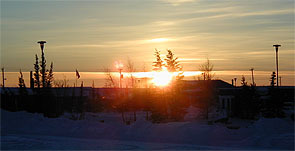 8 hours later we woke up here in Churchill. Mille checks the dogs are all settled in their boxes in the train. We have spent the last couple of days getting everything organized again, taking care of a few last minute items and very importantly talking with the locals about our route. The first obstacle ahead of us, is departing. We will have to cross over the Churchill River. This has been a route of travel as long as anybody remembers, but a few years ago a weir was built, which has changed the flow. This means that the ice crushes up, making sledding potentially very dangerous. With help from the people who knows the land and ice as their own hand palm we have found a good route. We will leave on the trail Tuesday morning - Less than 36 hours to go! This is called a Tundra Buggy. Churchill sits on a Peninsula. That means the ice will freeze here faster than elsewhere. So, every fall between 80 and 130 polar bears gather around Churchill waiting to get out on the forming ice so they can go hunting for food (seals). About 20.000 people travel here every fall to see the many bears. 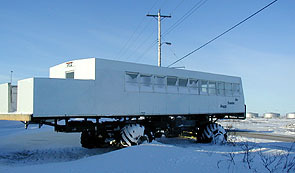 They drive out in these "oversize" vehicles made especially for this purpose, to see and photograph the bears.